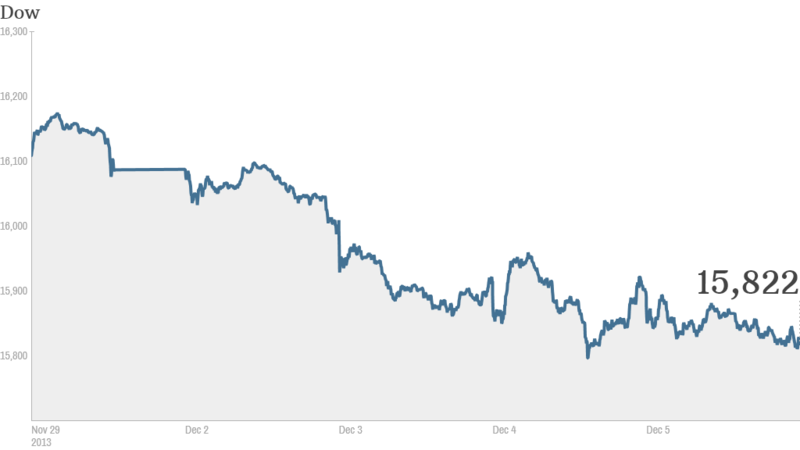 The Dow is on a five-day losing streak. Is this the start of a correction? Click the chart for more market data. The Fed's $85-billion per month bond buying program has helped fuel the bull market since March 2009. But the central bank signaled earlier this year that it hopes to gradually reduce the purchases as the economy recovers. It has said that improvement in the job market could trigger this process. The government's November jobs report is due Friday. Economists surveyed by CNNMoney expect that report to show 183,00 jobs were added last month. Related: Where should you put your money now? But not everyone is convinced the Fed will taper at its next policy meeting -- which wraps up on December 18. Alastair McCaig, market analyst for IG in London, said the holiday shopping season would be "a fragile time of year" for the Fed to pull back on its bond purchases. "Trying to squeeze something in before the end of the year would start a little bit of panic, the tail end of December being just an incredibly important retail period," he said. "It would be a little bit dangerous to do something this year." What's moving: On the corporate front, Apple (AAPL) shares rose following a report that the company is nearing a deal with China Mobile (CHL) to sell Apple's iPhone. 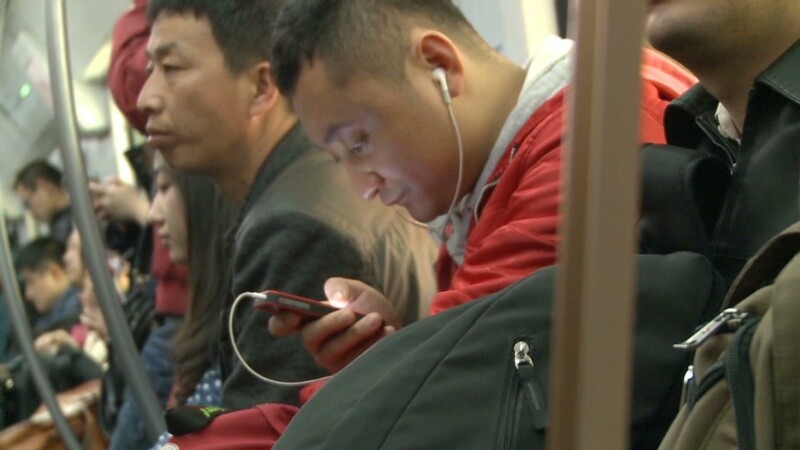 China Mobile is the world's largest mobile carrier. Shares of Apple have bounced back over the past few months, rebounding more than 50% from this year's lows in April. That's something traders on StockTwits took note of Thursday. "$AAPL is at its 52-week high...it's been a long time since we've been able to say that," said DaddyBiscuits. Microsoft (MSFT) shares tumbled on news that Ford (F) CEO Alan Mullaly is not planning to leave the company anytime soon. Mulally had emerged as one of the frontrunners to replace current Microsoft CEO Steve Ballmer once he officially steps down. The stock, which is up 40% this year, has gained 15% since Ballmer announced plans to retire in August. "$MSFT 13 year highs....that Ballmer should quit every day," said howardlindzon. J.C. Penney (JCP) shares fell 8%, extending Wednesday's losses as investors worry about the retailer's turnaround plan. Hedge fund manager Kyle Bass also told Bloomberg that his firm has sold its stake in J.C. Penney stock. "$JCP same-store sales climbed 10% during November, while its online sales were well ahead of year-earlier levels...why is this down???" asked ValueInvestor1. "$JCP Absolutely ridiculous! I don't care about the $$, this is the most unexcused absurd downturn I've ever seen. Just Criminal!!! BS!!!" said TechTrader17. Shares of discount retailer Dollar General (DG) rose 6% after reporting quarterly earnings that beat analysts' expectations and raising the lower end of its outlook for full-year profits. Electronic Arts (EA) shares tumbled 6% on continuing worries about technical problems with the video game maker's "Battlefield 4" game. Jos. A Bank (JOSB) reported a decline in quarterly net sales and net income, compared with the prior year. The clothing retailer has been in a bizarre takeover battle with Men's Wearhouse (MW), which originally rebuffed a hostile bid from Jos. A Bank before turning the tables and offering to buy its smaller rival.